How bored are you that you came to the Disclaimer page to see what's here? Really? There's better content to check out on the Bookshelf and the Blog page. Because there are a bunch of litigious ding-dongs out there, we all have to jump through this hoop. If you don’t like my opinion or my writing, feel free to move on. You can also leave a review on Amazon, Goodreads, or shout it into the arena of craziness known as anti-social media. I don’t give a damn. That’s your right. Just don’t be upset when I call you out for being a moron. Or if you do like my writing, we’re going to get along just fine. Stay awhile and put your feet up. There are plenty of things to read and do around here. 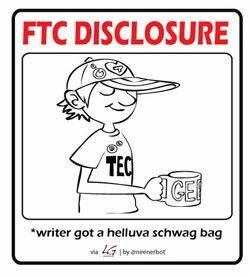 Per FTC requirements, I'm required to let you know that this website may be compensated through various types of marketing programs and/or affiliate links. Is that boring enough? The government can top it. 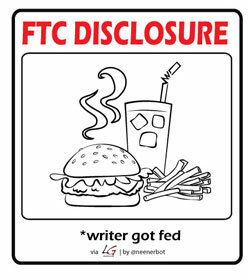 Read the handy-dandy FTC guide to disclosures - it's fifty-three pages of yummy goodness. Let's handle this like grown-ups. If you see links to outside retail websites, assume they are affiliate marketing links. If you buy something from one of the linked websites, I may get a commission / fee from that company. It won't cost you a thing (sort of like the love of Jennifer Lopez). Our government thinks you can't figure that out on your own. Is the internet so new that you thought clicking a hyperlink on my website wouldn't take you somewhere different? I mean, I wish I invented the hyperlink, but come on, really? If you see banners on the site, I'm not actually promoting the products. They are there just like an advertisement in a magazine, newspaper, or comic book. Do they require a publisher do this amount of disclosure for advertisers in a newspaper? Don't think so. You are an adult and understand how an advertisement works, right? If you're willing to admit that you don't, please stop reading this website about criminal fiction. You cannot be trusted to understand that this is fiction and not a how-to-manual on how to do bad things and get arrested for it. 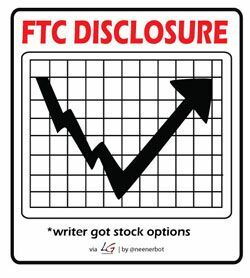 Thank you to Tim Ferris, author of The 4-Hour Workweek, for suggesting on his blogs's disclosure page, the following graphics to essentially cover all possible topics related to this issue. The illustrations are courtesy of Louis Gray and Jeannine Schafer. If you can't figure out the what's going on with the help of these graphics than this site is too high level for you. I suggest moving on to something more remedial - perhaps this site will be to your liking. Upon the initial posting of this disclaimer, I am not participating, but I may participate in the Amazon Services LLC Associates Program. I want to keep my options open. Sort of like LeBron James when he’s driving the lane. Or when he’s in the free agency period. This program is an affiliate advertising program which provides an opportunity for sites to earn a fee by advertising and linking to amazon.com. I hope you jump on my e-mail list. If you do, I won't share it with anyone else, including your mom. I promise. I don't want my mom spamming me with her crazy political views, either. So far, she thinks I'm a Luddite and am anti-technology. Don't tell her I have a computer. All web servers are going to track basic information about who's visiting a site. My provider is Squarespace and they do have some neat functions with their tracking software. I don't know what half of it means, but some of the stuff they can track is IP address, type of browser, time stamp, etc. They can even tell if you jumped on from a mobile device or a desktop. It's cool stuff, but it won't let me point you out in a restaurant. People may whine about cookies but if all you ever got were hunting-related advertisements while you're a lettuce-munching vegan, you might think they actually serve a purpose. You can change your browser settings to disable cookies if you have privacy concerns. However, this might interfere with performance of some sites. The best bet is to do it on a site-by-site basis. Look on the bright side, if cookies still worry you, these are gluten free so count that as a win and let's move on with our lives. If they still bother you, read a book. In the interest of saving time, I ripped this Disclaimer page verbatim from my real estate website, Building-Income.com, tweaking it only where necessary. If you haven’t checked out Building-Income yet, then you’re missing out. But hey, so am I since I’ve moved on and amnow cranking out awesome crime fiction stories. By the way, I know my girlfriend is right about ‘jibe’. I just think ‘jive’ sounds cooler, in a James Brown sort of way.